July is UV Safety Awareness Month. See three tips on how to protect yourself from harmful UV rays, which are the leading cause of skin cancer. 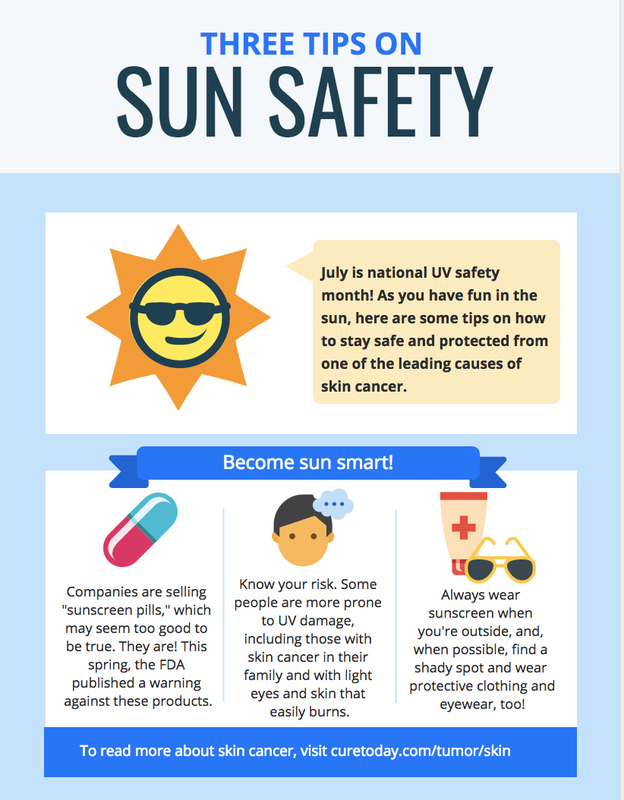 July is UV Safety Awareness Month, but it is also important to remember skin protection throughout the whole year. According to the American Cancer Society (ACS), ultra-violet (UV) radiation exposure is the root cause of most skin cancers. Sun safety has been on former Philadelphia Phillies third basemen Mike Schmidt’s mind since he was diagnosed with stage 3 melanoma in 2013. For the past five years, the MLB Hall of Famer has been advocating for staying protected in the sun and has even advocated for the implementation of sunscreen dispensers in Citizens Bank Park, as well as throughout parks and public spaces in Philadelphia. However, sunscreen should not be the first – and definitely not the only – line of defense against the sun. The ACS stressed that it is also important for individuals to wear protective clothing, and find time in the shade, when possible. Knowing your risk of skin cancer is crucial, too. One CURE contributor found out that she was at a higher chance of developing skin cancer since she was a breast cancer survivor with a BRCA2 genetic mutation. Now, she is sure to get annual dermatology checkups, and practices her own sun safety, which includes protective clothing, sunscreen and hats! There are steps that individuals can take between dermatology checkups, too. Recent research conducted at NYU Langone Health explained how patients and their caregivers are on the “frontline” of melanoma monitoring. Many individuals will notice a suspicious mole or lesion before a health care professional will, so it is crucial to know what to look for. While being in the sun can offer some health benefits, such as an uptake in vitamin D, it is important to talk to your health care provider about any particular risks you might face regarding exposure. And remember, be smart in the sun!